Figuring out how to remove stains on clothes can be stressful especially if it’s an important sports uniform or fancy outfit. I’m so excited to introduce this amazing new product that gets rid of the toughest stains and even the smells from my son’s sports gear. 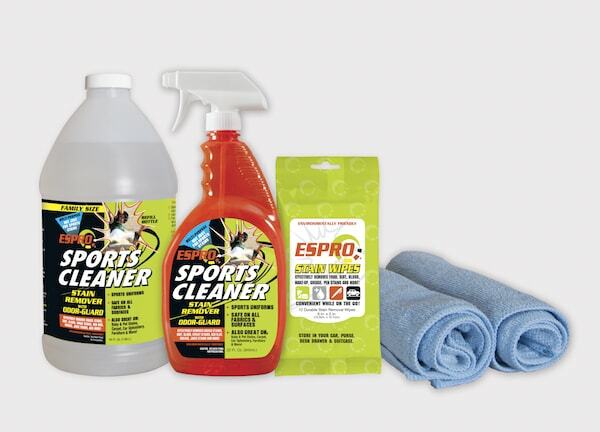 This post has been sponsored by ESPRO Sports Cleaner but all thoughts shared here are based on my experience. 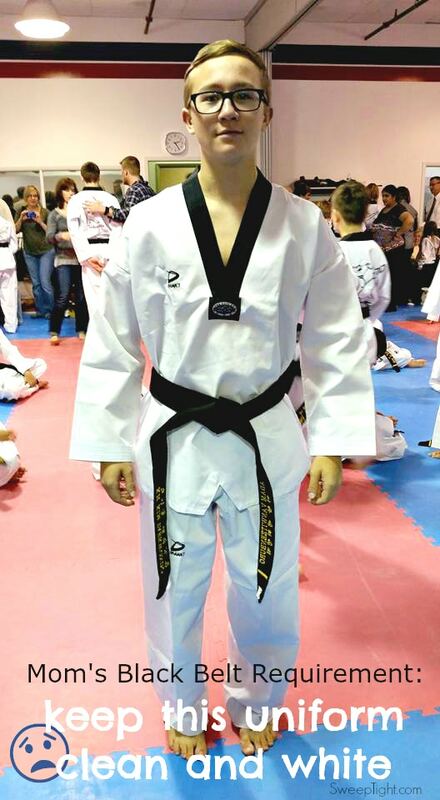 My son recently received his black belt in Taekwondo. <Woohoo!> I’m so proud. 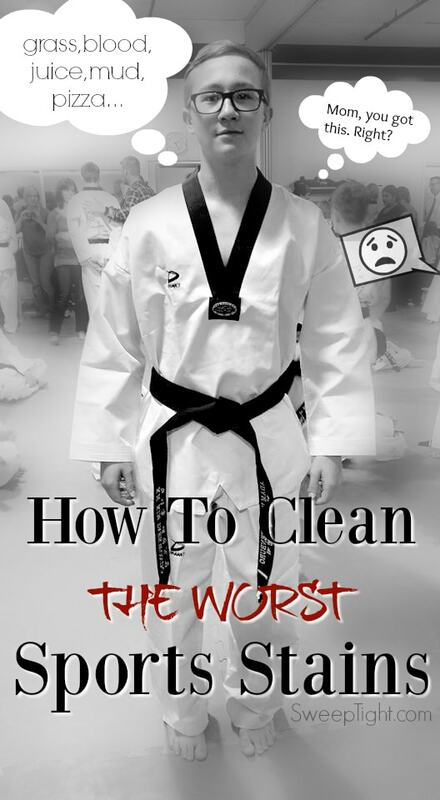 However, part of my responsibility is to keep his uniform clean and crisp–it’s actually a factor when they’re judged! It’s so freaking stressful when he sweats, bleeds, eats greasy pizza, and practices in grass, all in this bright white uniform. It has been a long road to make it this far and I’m sure not going to let all his efforts go on in a dingy stained outfit especially when it comes time to test in front of his masters. For now, his black belt uniform is pretty new. But his all-white one from before has been through it all. 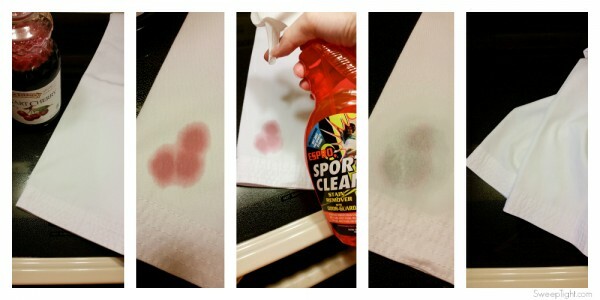 So, we decided to put ESPRO Sports Cleaner to the test. We put a little tart cherry juice on his old uniform and let it sit overnight. The next day, I sprayed with ESPRO Sports Cleaner. After one spray the stain was already almost gone! I threw it in my normal wash load and these old pants are whiter than they’ve ever been. I was pretty much expecting the stain to be gone, since this product has so many great testimonials, but I cannot believe how bright the whole uniform is now! These photos really don’t do the results justice. The lighting was tough to get right because I took them a day apart, but you can clearly see the stain removal was a great success. In person, you can really see how much whiter they are overall. It gets out red clay, grass stains, blood, sweat stains, food stains, juice, dirt, field paint, grease, …. It’s also safe to use on all fabrics (even silk!) and is environmentally friendly! I really don’t know how it can get any better. I’m getting rid of every other bottle of stain-remover, odor-eliminator, carpet cleaner, pre wash, and sports cleaner in my house. This is all I need. What are your tips for how to remove stains on clothes? My girlfriend was just complaining about her sons soccer uniform being white and having issues getting stains out!! This sounds like an awesome product for stain removal. We have two kids and over the years have done a LOT of sports. Those uniforms are not cheap and it is so hard to take care of them! Thanks for the tip on keeping them clean…will come in handy! This would be a huge help for all the formula stains on my daughter’s clothes and to help keep my hubbys shoes clean and smelling fresh! 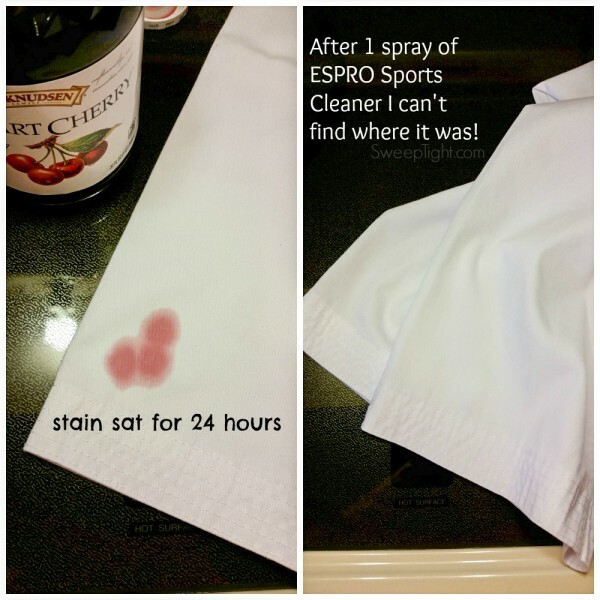 I would like to win the stain remover spray!TY! I would like to win because I need a stain remover that works. Okay…that is amazing! I have a terrible time with stains never coming out of my clothes. Obviously I just need a different product! Aside from dd’s activities (jazz, tumbling and karate) that I need this for, she is messy! She is forever staining her clothes – dirt, grass, food, etc – it will find it’s way onto her clothes! There are some that I just can’t get out no matter how many times I’ve treated them! Would love to try this! This looks great! I’d love to win and try the stain wipes. We always have problems with the kids coming home dirty in red dirt. I would like to try this because there are some stains that I cannot ever get out. Perhaps this would work. My kids always manage to get new stains on their clothes. I will have to try this out! I want to win because I have not found a product or way to remove set in stains and to pretreat like this one. I want to win because my husband is a farmer and he gets stains on his clothes that are tough to remove. I would love to win this because I’m pretty messy (no matter how hard I try to keep my clothes neat). I’m constantly getting stains on my clothes. I dont go anywhere without my Tide to Go pen. This would be awesome to use to clean up our messes. I would love this because it never fails me or my husband is always putting a stain on our clothes. He works on our car changing or or doing something and gets grease on his clothes. My kids’ clothes are always getting dirty…and so are the seats in my car! I bet this would get a lot of use in my house! I would like to win because my 6 yr. old son stain EVERYTHING he wears. I just bought him new clothes and he managed to stain all his pants within 2 days! I need this desperately! I would love to win because I have 3 messy boys that are always staining everything. This would be great to have to use. I’d love to win because I have an 11 year old son who just can’t keep his lunch off his clothes no matter what, and I’m sick of having to throw out practically new clothes. I want to win because my kids are messy messes everyday! They come home from school with food stains, pen stains and other stains on everything! i am constantly having to use good clothing for play clothing because i never can get the stains out of the shirts and pants! i woudl LOVE to have something that would help me save my kids clothing! I would love to win because with all our grandchildren, there is always something getting stained. From clothes to carpets, to even the cars seats. I would love the opportunity to try it! I’d like to win because they look like they might actually work! It’s about time they come up with a solution to this stinky problem! I would love to win because this looks very useful to clean up messes on clothes!! I would like to win so that I can get some of the stains out of my kids clothes! I’ve had to throw many things away because of stains. I would love to win because set in stains are always an issue in my house. My son split hot chocolate on a brand new shirt today!! I’d give this to my friend who has 2 kids in soccer and needs it. I’d like to win because there is always some kind of nasty stain on something at any given time — that defies removal!